As I told you last week, more stores are closing on Thanksgiving and thanks to online purchasing going up there looks like there will be less activity on Black Friday this year as well. This is a great article from twocents.lifehacker.com about the pending death of Black Friday. 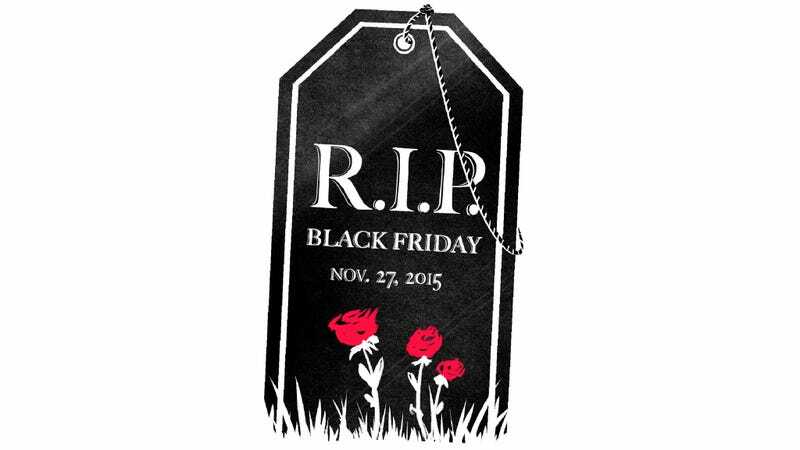 If you’re planning on bundling up and waiting in line at Best Buy or Walmart with the rest of the hordes, you might want to reconsider–there are better deals out there to be had, and you don’t have to risk being added to the list of Black Friday deaths and injuries. Don’t get me wrong, there are some great deals to be had this time of year. But lining up in the cold to nab a cheap 55” TV? No longer necessary. Black Friday isn’t what it used to be, and that’s a good thing. You probably already know that you don’t need to wait in line to participate in Black Friday. Most retailers offer the same “door buster” deals online, so why camp out at the mall in a post-turkey coma? If you’re busy and trying to save money, you might think Black Friday (or Cyber Monday) are the only days you’ll find great deals, but that’s simply not the case. Black Friday has become nothing more than a marketing phrase, and there are easier options for finding sweet bargains. Last I checked, Friday was a day of the week, but now, “Black Friday” has become a month-long event. Analysts call it the “graying” of Black Friday: the day after Thanksgiving no longer has as big of an impact on retailers’ annual revenue, because they’re starting Black Friday earlier and earlier. No, they are often lower later, often falling further the week before Christmas. Toy prices are cheapest in mid-December, with winter clothing cheapest the weekend before Christmas Day. Bottom line: Yes, you can still get great deals on Black Friday. But you can often get the same deals on other days, without the hassle. And that way you don’t waste your money. Of course, it depends on what you’re buying, too. November in general does indeed have some of the best deals on TVs and electronics, but those deals continue on into December, usually well up to the super bowl. In fact, super bowl deals are often better, if not just as decent. For example, Sears is offering the 40” RCA TV on sale for $269 for Black Friday. But they offered the same bargain earlier this year for the super bowl. This isn’t to say you shouldn’t buy the TV you’ve had your eye on if it’s on mega sale around this time of year. AsKinja Deals’ Shane Roberts points out, it’s hard to generalize the best months to buy stuff, because there are great deals to be had all year long. The point is, there’s no need to schedule your life around shopping days. If you really love getting a bargain, start shopping earlier. This summer, for example, Amazon had a massive jewelry sale. I stocked up on Christmas gifts, and half my shopping was done—at a bargain. The earlier you start shopping (and preparing), the more you can take advantage of deals beyond Black Friday. Kinja Deals is great to follow for bargains all year long. They take their deals pretty seriously and price track stuff all the time, so when they post something, you know it’s a legitimate bargain. Off brand items: Oh, that 55” TV is on sale for $200? Sounds great at first, until you find out it’s a brand no one has ever heard of or one that no one wants because it’s notorious for having issues. Last year, for example, Walmart sold a 60-inch Element TV for $499. Great price, but not great quality, according to Consumer Reports. Bundling: For one “sale” price, you can get a new camera, extra batteries, a camera bag, and an SD card. You only wanted the camera, but now you’re spending a hundred extra bucks for some “freebies” you didn’t really need. Getting you in the door: From a personal finance perspective, Black Friday thrives on giving you a coupon high. As good as the deals may be, make no mistake, it’s a sales tactic meant to get you in the door and lure you with other flash sales so you end up impulse spending more than you’d planned. Of course, as Roberts says, this isn’t just limited to Black Friday—retailers do this all year long. It helps to simply be aware of how you’re manipulated, but here are a few ways to tell if a deal is really a deal and be smart about your spending. Track prices ahead of time: Use a price tracking tool like Red Laser,CamelCamelCamel, or InvisibleHand to check the price history of an item. Camelcamelcamel, for example, will tell you how low that item’s price has been in the past several years. This way, you can see if the Black Friday price you’re getting is really a good one. Check manufacturer prices: CNET recommends heading to the manufacturer’s web site to see what the MSRP of an item really is. Many times, retailers will slash their deals only to exaggerate how expensive the item was to begin with. Unbundle: Price check each of the accessories that’s being offered in the bundle. Are the deals that great? Chances are, you can get better items for the same price, because most of the time, the accessories retailers offer aren’t going to be high-end. Forget camping out to save a couple of hundred bucks—even online deal hunting can be a waste of time. Saving money is great, but your time and energy are important, too. Around the holidays, you want to preserve as much of both as possible so you can enjoy the season without being overwhelmed with hustle and bustle. And these days, there are so many tools that make it easy to find decent prices, you don’t need to spend hours researching your options anyway. Take Macy’s for example. They have a 14 day best price guarantee policy. That means that any item purchased at Macy’s starting November 13 would be eligible for a Black Friday deal. The time window differs at every major store (usually 7-14 days), but the conclusion is the same — you won’t really have to shop on Black Friday for Black Friday deals anymore. Here are a few ways you can take advantage of Black Friday prices without a lot of effort. Get price alerts: Instead of waiting for specials, make a list of stuff you want to buy for the holidays, then track those items online. You’ll get emails when prices drop, and you’ve saved yourself some time and effort by not researching all the deals and pseudo-deals. Get refunds on price drops: I’m a fan of Paribus for automatic price drops. You link your spending account info, and when you buy something online, if the price of that item drops, Paribus will automatically ask for a refund. This way, you can get your shopping done, and if there happens to be a crazy deal on that same item, you’ll get refunded. Many retailers specify that their price drop policies don’t apply to sales on November 27, but again, there are plenty of “Black Friday” sales to be had all season long. Stick to your list: Chances are, you’ll save a lot more money on gifts buymaking a list that’s within your budget, and then sticking to that list. You might miss out on a deal or two, but you’ll be better off than 25% of consumers who struggle to pay off debt after the holidays. Every so often, you’ll see a can’t-pass-up deal on Black Friday. They still exist, but with Black Friday starting earlier, and consumers becoming more deal-savvy, there’s no need to spend a huge amount of time or effort staking out prices.